I temped for a lawn & garden manufacturer. They are awesome people but there was something strange about the place. There were always plastic pink flamingos around. They were everywhere but that plant doesn’t make or distribute them. The flamingos were in offices and cubicles. They were made into lamps, into art, into all sorts of things (along with really cool welded sculptures). I found I really loved those flamingos. Not in some hipster ironic way but I loved them sincerely and honestly. 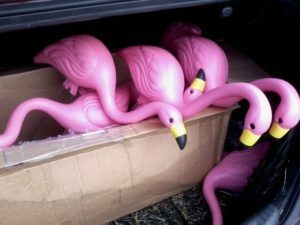 As I was born on that wonderful holiday “National Plastic Pink Flamingo Day” I received an entire box of flamingos for fulfilling my duties. The HR manager at the time even decorated the entire office in the most amazing way ever. Again, awesome. Well, I have no understanding of electrical engineering. But I can do random things with random stuff. 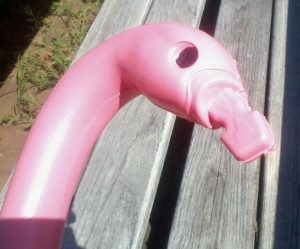 So, how would you like to learn how to build your very own flamingophone? Of course you want one! Who doesn’t? Granted, I’m not finished with this project as there are a few issues I need to work out. A capped reed instrument like this requires a lot of finesse but I don’t really finesse anything. Anyway, let’s get started. How does one re-create such majesty? Have you ever heard a crumhorn played poorly? It’s a near perfect match and my eventual goal. The crumhorn is a capped double reed instrument with quite a unique sound. Now, before you go out to get a crumhorn reed let me warn you that I’ve only found them in the UK and with shipping the cost of one plastic reed will run about $50.00. I won’t spend that much money on anything. I experimented with quite a few reeds trying to find something perfect. It had to be easy to vibrate but also durable. Then, one night I was talking to a friend when it hit me. Bagpipes. Of course! Bagpipes! Bagpipes are also a capped double reed instrument. The plastic reeds can be found easily and they are pretty durable. But hey, if you want something else I’m not going to judge you. We need to get rid of this. Once that is done clean up the hole a bit. Obviously, you’ll want to make your flamingo sing a variety of pitches. Creating finger holes requires a detailed knowledge of physics. One must measure the thickness of the material, the bore of the cylinder and take into account what one needs to be able to play. (Chromatic? Quarter tones? Twelve tone? Just John Cage’s 4’33”?) Yeah. I didn’t feel like doing any of that so I just poked some holes to see if it worked. I tried various materials to stop the hole and place the reed. I originally tried cork but found it too brittle. So, go to a science supply shop and buy various sizes of rubber stoppers for beakers. Yes, they will look at you funny but you are building a flamingophone. This goes with the territory. You haven’t questioned my judgement so far. (Why you haven’t is beyond me but let’s continue.) Find one of the stoppers with hole. Shove the stopper in the hole you cut near the beak. You want it in there pretty tight. The reason to get an assortment of stoppers is that you have no idea exactly how big that hole will be. Once that is done you’ll need to place the reed in the stopper. Thankfully, plastic reeds are pretty forgiving but be as gentle as you can. You’ll notice that there isn’t a cap yet. Well, I haven’t gotten that far. I need to reconstruct a place for the beak out of plastic. Since I have the measuring skills of a gnat I think I’m going to outsource that one. I also have some air leaking somewhere that I need to trouble shoot. So, we’ll finish this project whenever I get around to it. However, if you have followed me to this point then you at least have a glorious plastic roseate spoonbill. This is also the piece in the nifty little play box down at the bottom there (different arrangement). I woke up this morning with music in my head which is very very typical for me. Unfortunately, the sound evaporates quickly and all that is usually left is a feeling. So, I was extremely pleased that I was able to get at least a version of the piece written down before that happened. By 8:13AM I was finished sketching all of the parts. I hope you enjoy it as much as I enjoyed writing it.